Diableard growers! Stand and be counted, for your face’s rebirth is at hand. If you’ve been one of the strong, one of the proud to grace all those around you with the sumptuous sight of untamed whiskers, your day has nearly arrived. 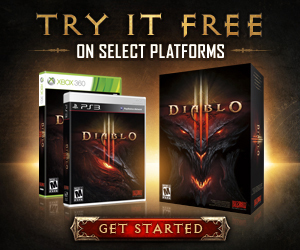 Almost nine months ago, we challenged you to grow your facial hair until the release of Diablo III. For those who didn’t have the chops (or the necessary physiology) to handle the unadulterated awesomeness that is a Diableard (or Mephistache), we asked you to craft a mock-beard and display it proudly for all to see. Your efforts astounded us... again, and again, and again, and again. Then tragedy struck. With the game delayed to 2012, we feared for your hygiene, and offered you a reprieve from the shackles of your crumb collectors. But some of you exclaimed “Nph!” (which we assume was a “No” muffled through your overgrown soup strainers) and held your ground. To those of you brave enough to continue defending your follicular extrusions against the outcries of your significant others, we want you to know that you’re not alone. We will join you in your exaltations as your Diableard is shorn from your face at midnight on May 15. The hour of reckoning approaches, my bristly comrades. Even if separated by great distance, we will stand together, clean and smooth and bare to the wind. Stay strong, for the Diableard Hack-and-Slash is nigh!